Fun With Puzzles Brain Teasers Non Verbal Reasoning Puzzle Questions Puzzles Word Puzzles Which Letter Replaces the Question Mark? 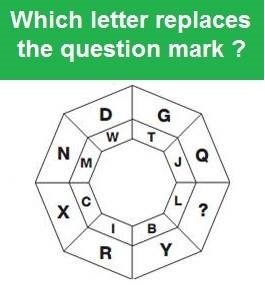 Which Letter Replaces the Question Mark? Can you tell which Letter Replaces the Question Mark?